Kineti L'Tziyon קנאתי לציון: Deut. 14 - Can gentiles eat unclean meat? Deut. 14 - Can gentiles eat unclean meat? Ever see some ugly, inflammatory thing said on internet, and you, filled with emotional zeal, just had to respond? You nerd-ily peck away at your keyboard with great fury, showing the world just how wrong that other guy is. I dub that reactionary blogging. I promised 2010 would see less reactionary blogging from me, and I’ve been faithful to that promise. Despite one Kineti blog reader mistakenly thinking I’ve abandoned my principles, in reality I’ve focused more on contributing good to the Messianic community – unifying topics, Messianic community round-ups, Chavah Messianic Radio, the Greatest Commandments Project, for example – things that benefit Messiah’s intarweb-dwelling kin. But behold: today you all witness a reactionary post on the Kineti blog! But I promise it is not emotionally charged. Instead, it’s meant as a public, on-the-record response to another Messianic blog. Give the other side a chance to speak. Get both sides on record. That’s a good thing. The fact that laws given to Israel in the Torah do not necessarily apply to non-Jews is evident from Deuteronomy 14:21. This verse is one of the banes of the universal Torah movement (One Law, Two House). It goes against every principle of the universal Torah movement to say that a gentile may eat unclean meat. To date, I have never heard a cogent reply from the One Law folk about how this verse fits with their theology. I found this statement amusing: never once have I considered this verse problematic. It’s amusing to see it portrayed as this show-stopping, dead-in-the-water problem, when in reality it’s a complete non-issue. I do not consider Deut. 14 problematic, and I’ll explain why in a moment. That Derek thinks it’s problematic suggests he is misinformed about what, exactly, pro-Torah folks believe, and that he may be missing a really big honkin’, lights-a-blazin’ important part of our Scriptural understanding. Yes, honkin’, I say! Derek thinks this is a problem for pro-Torah people because it says gentiles can eat unclean things. Remember that formerly you who are Gentiles by birth and called “uncircumcised” by those who call themselves “the circumcision” — remember that at that time you were separate from Messiah, excluded from citizenship in Israel and foreigners to the covenants of the promise, without hope and without God in the world. But now in Messiah Yeshua you who once were far away have been brought near through the blood of Messiah. Deuteronomy 14 presents no problem, as gentiles are no longer separated from God or excluded from citizenship in the commonwealth of Israel, nor are they foreigners to the covenants of the promise. The gentiles of Deuteronomy 14:21 and gentiles in Messiah are not the same people group. I would even venture a guess that Derek would agree with me on this point. Deuteronomy 14:21 is a problem only if one ignores Messiah’s transformative role in regards to gentiles and Israel. Indeed, Derek’s post is silent on this honkin’ big crux issue. Ok, I promise to stop using the word “honkin’” now. While both parties agree the Torah was given to Israel, and both parties also agree Messiah made gentiles members of the commonwealth of Israel, what bilateral ecclesiologists (or at least, Derek Leman) fail(s) to recognize is that Messiah is central to this grand Torah-for-the-nations idea. The Torah cannot go forth from Zion without Messiah. Now Messiah has come, he’s changed gentiles into first-class citizens in the commonwealth of Israel, and the Torah is going out into the whole world. These prophecies are coming to pass, right now. Because of Messiah, God’s righteous commandments have gone global. (Praise God!) Let’s not oppose it. Judah, the sooner you'll admit that "One-Law" (it should really be called "Gentiles Under Mosaic Law Theology") is a failed theological concept with a half a leg (or less) to stand on, the better it would be for everyone involved (or at least for those who read your blog and comments:) Seriously bro, drop it - it's a hindrance to healthy relationship between Gentiles and Jewish believers. Yeshua has already brought Torah to the Gentiles - he's that Torah and it's he who knocks on and enters our hearts! However, the Torah that Yeshua brought for Gentiles doesn't require Gentiles to live as Jews, simply because G-d laws are not generic and aimless mishmash for all of mankind, but are precisely tuned instructions to very specific groups of people (as G-d has always intended them to be). This is a comment on the broader discussion of non-Jews, Torah, and membership in the Commonwealth of Israel. It seems to me that we often use the word “Torah” in a very confusing way. It refers to two very distinct things: “Torah” (as found in the Scriptures) and “Tradition” (Torah as it has developed among Jews for about two millennia. Jewish usage of “Torah” is almost always “Tradition,” unless it specifies biblical Torah. Messianic usage of Torah is almost always unclear and confusing. A lot of the misunderstanding and friction in these discussions arise from this lack of clarity. Let’s imagine we all agree that the Bible says God intended Biblical Torah to apply, in all its details, to all people! What, then, is the basis for non-Jews to take on the distinctive characteristics of Jewish Tradition, especially when the Tradition itself strenuously objects to it? To put it another way, Messianic Jews agree that faith in Yeshua as Messiah is crucial enough to override the objections of Jewish Tradition. On what basis do non-Jews override the objections of Jewish Tradition and the vast, vast majority of the Jewish community to non-Jewish public practice of distinctively Jewish Torah-observance? Non-Jews may keep the commandment in any number of ways. But why keep it with a tallit that is designed specifically by and for Jews? Is there a biblical basis for them to wear a tallit in in this specifically Jewish form (with a particular type and number of knots)? Concerning your post, would you say that membership in Commonwealth is essentially the same as being a Jew? If not, doesn’t non-Jewish practice of distinctively Jewish traditions obscure the identity of Israel? Doesn’t it make continuity of Jewish identity especially difficult (if not impossible) in a Messianic congregation? Gene’s comment about congregations that are 20% Jewish (or less) is especially relevant: How can Jewish identity be passed on to Jewish children when there is no practical difference between the public practices of Jews and non-Jews in such congregations? So, IMO the issue is not the practice of biblical Torah—we can agree to disagree on that—but Jewish Tradition. To begin with, it would be helpful for ALL references to Torah to be clarified: are we talking about biblical “Torah” or “Jewish Tradition”? This is part of what I've been trying to say in my last two What Did Jesus Change? posts on my blog. If Gentile believers base their status relative to God and the Jewish people entirely on being "Ger" in the various passages of the Tanakh, then why would Yeshua have to come to reconcile mankind to God? Good point, Judah. ePerhaps the Gentile sojourners in the time of Moses could eat unclean meats (although if they were permanent residents who eventually would assimilate into larger Judaism, they probably voluntarily only at clean meats), but you make a good point as to why, as Gentile "Yeshua-believers", we should conform our eating habits to God's wishes. I really don't think what I said was inflammatory. I said it was the bane of the universal Torah movement. (1) the universal Torah movement says gentiles are obligated to Torah in the same way as Jews. (2) Deut 14 says gentiles can eat unclean meat. (3) the universal Torah movement is wrong. (1) the universal Torah movement says gentiles who believe in Yeshua are now Israelites. Your argument is logical if one accepts (1) (that gentiles who believe in Yeshua are now Israelites). You will find very few who agree with your idea of what Ephesians 2 means, either by Christian or Messianic Jewish scholars. You will find your gentiles-turned-Israelite principle very difficult as a presupposition for reading Acts 15 and Galatians, not to mention many other texts. I would be interested sometime to see your reading of Acts 15 and Galatians. I don't mean one of J.K.'s podcasts or a 10,000 word commentary in print somewhere. I mean in 1,500 words or less to lay out your view of the central point of each of these texts and how you read them in coherence with a Two House view of Israelite identity. Like you, I am interested in truth, not affiliations and loyalties to preconceived ideas. Persuade me. But meanwhile, you have not gained anything by saying "all Christians are Israelites." "Sorry Gene, it's Scripture, so we can't drop it! :-)"
Judah, I am sure your interpretation of scripture (rather your readings of your beliefs BACK INTO the Bible) allows you to come to such conclusion. However, you are in a a tiny minority to hold such beliefs, and your beliefs go against Christian, Jewish, and Messianic Jewish understanding of scripture (and as far as I can tell, One-Law movement doesn't have too many bright scholarly stars to illuminate the way - well, to clarify, it doesn't have any). I must say that you really have much faith in your own understanding, or in Tim Hegg's ability to interpret scriptures. I'm honored to have you reading and commenting on this blog. You posed some questions. I will respond. >> On what basis do non-Jews override the objections of Jewish Tradition and the vast, vast majority of the Jewish community to non-Jewish public practice of distinctively Jewish Torah-observance? On the basis that the Messiah changed the nature of gentile relationship to Israel and the covenants. The objections of the Jewish Tradition miss this crux because they miss Yeshua. >> Non-Jews may keep the [tallit] commandment in any number of ways. But why keep it with a tallit that is designed specifically by and for Jews? Is there a biblical basis for them to wear a tallit in in this specifically Jewish form (with a particular type and number of knots)? Practical: if a gentile wanted to keep the mitzvah to "remember God's commandments via tassels on the garment", the best he knows how is to buy the ones they sell to Jewish people. If you object to gentiles doing distinctly Jewish things -- suggesting perhaps they should use fringes but not a tallit with knots -- such people are then accused of "silly, self-defined Torah observance", to quote one of your colleagues. >> Concerning your post, would you say that membership in Commonwealth is essentially the same as being a Jew? However, gentiles becoming members of the commonwealth of Israel drives into action that old prophecy that the Torah would go out to all nations, and that people from the nations would be drawn to Israel and Israel's God. Messiah did a remarkable thing in that area, and it's taken awhile to accomplish, but it's happening. All: I hope the rest of the comments in this thread will address Scriptures raised, rather than defend entrentched theological positions. Cool! We found out where we disagree: when Paul says gentiles were formerly excluded from citizenship in the commonwealth of Israel, you think he means they're still not citizens. Fair enough. Clarity over agreement. First, you have not answered how your "Christians are Israelites" view squares with Acts 15 or Galatians. Second, you imply I don't agree with the teaching of Ephesians 2. I do agree with it. I interpret in in a nuanced manner that takes all evidence into view. I do not, as do you, assume it can be interpreted to mean "now in every sense of the term, you gentiles are Israelites." Paul is careful to qualify and say "excluded from the commonwealth of Israel," not "excluded from Israel." It seems there is a difference. It seems Christians are taken into some aspects of the promises to Israel and not others. I would say from the rest of Paul's theology that the aspects into which Christians are included are salvation, a priestly calling, and nearness to God. But they do not take on Israel's distinct calling and Torah covenant (Galatians should be clear enough). Would Paul say to a Jew, "You must not be circumcised"? He said it to Christians. Why, if he did not make a distinction? Both you and Gene have said you agree that gentiles are part of the commonwealth of Israel. Since we agree gentiles are part of the commonwealth of Israel, of course I believe the gentiles of Deut 14:21 are not the same as gentiles in Messiah. I think you, Derek, might even agree with this. Okay, we are getting somewhere. There is a difference between Jews and non-Jews in Messiah relating to Torah (the written commands as well as the traditions of observance). You agree with me about this. Good. Now, why do you assume that dietary law is required of non-Jews in Messiah (who are in the commonwealth of Israel) but circumcision is not? And since you do assume it, is your point provable or assumed? "Since we agree gentiles are part of the commonwealth of Israel, of course I believe the gentiles of Deut 14:21 are not the same as gentiles in Messiah." Judah, I suppose the only problem still remains for you is to explain why Gentiles in Messiah and Commonwealth of Israel are still not viewed as obligated to Mosaic Torah as given to Israel by the apostles (actually, explicitly so in many texts). Perhaps you read too much into Messiah saving Gentiles and drawing them closer to G-d and Israel by also saying that their relationship to Mosaic Torah became on par with that of the Jews and that we are all now de-facto "Israelites" (instead of Jews being Israelites and Gentiles being Citizens of Commonwealth of Israel, respectively). Since all 3 of us agree (!) gentiles in Messiah are members of the commonwealth of Israel, I believe the gentiles spoken of in Deut 14 is different than gentiles in Messiah. "Messiah are not the same people group as the unclean gentiles of Deut 14?" Judah, do not call ANY MAN (the key word is ANY) unclean, and that must include people without Messiah (and by default, those Gentiles in Deut 14). Furthermore, your premise is faulty - Messiah didn't come to alter the level of Gentile responsibility to Torah, rather his sacrifice allowed them to aquire hope, Holy Spirit, salvation and citizenship in the Commonwealth of Israel. We're not in as much agreement as you think. Sorry. (1) Non-Jews in Messiah are in the commonwealth of Israel. (2) They are therefore in another category in relation to Torah than the sojourner or foreigner of Deut 14. (3) Therefore, non-Jews in Messiah may not eat unclean meat. (1) Non-Jews in Messiah are included in salvation, nearness to God, and a priestly calling and election. (2) Their status toward Torah (in this age) is clarified by Acts 15 and Galatians to be as the gentile. (3) Therefore, they may eat unclean meat as Noah did (Gen 9:3) and as the sojourner and foreigner of Deut 14:21. You assume that "commonwealth of Israel" affects the way non-Jews relate to Israel's Torah covenant. I do not. I have the apostolic teaching in mind. I have to interpret Isaiah 2 and similar passages (about the world to come) in a way that harmonizes with the apostolic teaching in Acts 15 and Galatians. Maybe you should teach me some of your masterful rhetorical devices, because that was a spectacular deflection! Not only have you avoided my appeal for agreement, but now I must defend myself from these serious accusations! All: I still hold, and I'm now convinced further of the rightness of this idea, that Messiah-loving gentiles today are not the same heathen foreigners referred to in the Torah, including Deut. 14. So while you agree gentiles are members of the commonwealth of Israel, you don't think it changes their relationship to Torah or the covenants made with Israel. I do, in fact, I think Paul states this explicitly. Well, clarity over agreement. This is a fork in the road where we part ways. Good to know where that point is. Judah, I understand - something there's nothing to say. I do admire your faith in your idea and your steadfastness to your cause (and ideals, as you see them) in the face of powerful counterarguments to the contrary. However, my advice to you is to not let pride get in the way of acknowledging that the teachings of apostles do not obligate Gentiles to Mosaic Torah, but instead given them freedom from the yoke given to Israel, the very freedom which so amazed the Jewish disciples of Messiah and gave so much to rejoice over to the first Gentiles followers of the Master. I know how hard it can be to change, Gene. Even though our powerful arguments have fallen on your deaf ears, don't worry, Gene, once Messiah comes, and gentiles are keeping the Feasts and Shabbat and serving in the Temple and keeping God's ways, you'll be moved, and Messiah will change you. I know it's tough to swallow your pride. I admire your devotion to your views, temporary and silly as they may be. I'm tempted to invoke Godwin's Law, just for the fun of it. I guess I am a little late to the party. I did not yet read all the comments, but in glancing I am very surprised that no one pointed to Lev. 17:15 which when compared to Deut. 14:21 offers a seeming contradiction: "When any person eats an animal which dies or is torn by beasts, whether he is a native or an alien (GER), he shall wash his cloths and bathe in water, and remain unclean until evening; then he will become clean." Did not see that coming did you? In the Lev. text, it is clear that a GER is not to eat of the unclean food. The deut. text appears to allow the Ger to eat unclean meat (he is not subject to the Torah commandments of unclean and clean foods). How do you explain this? Lev. 17:15 begins with "any person" (v'kol nefesh) and further adds "whether native or alien" (b'ezrach uveger), showing that in this text the Torah was considered universal for all withing the community of Israel. The deut. passage alows the torn meat to be given to the "alien who is in your town, (literaly in you gates0, presumably because the alien (in this case) is allowed to eat what is unclean. But here the Ger who is "in your gates" must denote a visitor, not the same level as the ger in Lev. 17:15. The LXX also note the distinction, in Deut. 14:21 they translated "alien who is in your town: with the word "paroikos", while in the Lev. 17:15 passage they use the word "Proselutos" to translate Ger. The word Ger should be read and understood according the context it is written in. Interesting, indeed, Dan. Thanks for that. That adds an additional perspective to this whole thing. I hope readers will recognize this bit of Scripture is not "all gentiles in Messiah can eat dead animals/unclean meat", which is what Derek implied. By the way, Dan, you need to read all the above comments. I totally tore Gene a new one. Totally. I'm wondering if I should apologize to him for tearing apart his weak theologies with such manly strength and vigor. Maybe I should play him a gentle song on my abs-xylophone to soothe his woeful existence, now that his theologies are destroyed. I could be like David soothing Saul. Only with abs-xylophone replacing the harp. According to your theology (at least in you first comment), Jews don;t have to follow torah either, since Yeshua the Torah Himself (as you say)gave the Jews only the "two greatest commandments. ".....But how come i have the feeling you will not agree? I responded to your identical comment on Derek's blog. Your argument is not consistent either. what about a Gentile who is circumcised but do not follow Torah? how many Israelites like that we all know? Don't despair, sometimes it is very difficult to debate a preacher (isn't that what Gene is really doing? ), they tend to listen only to themselves....Love you Gene!!! I think ALL of us are wrong! Regarding Leviticus 17:15, you display a solid knowledge of Torah and I applaud your ability to bring this verse up. I am amazed how many "Torah lovers" don't really make many arguments from Torah. But you did not catch me unaware. I read the Torah thoroughly and thoughtfully (as I am sure you do, as well). I am quite a fan of Jacob Milgrom's commentaries and ideas about Leviticus. Leviticus 17:15 says that the impurity of the act must be dealt with. Impurity defiles God's Temple (Lev 15:31; Num 19:13). It does not say it is forbidden for the sojourner and foreigner to eat the meat. Most kinds of impurity do not involve sin (childbirth, menstruation, caring for a corpse). They all require purification of some type, however. We conclude then that eating torn meat requires purification but is not a sin for a non-Jew. this was not my point. what I am saying isthat when we read these and other verses we have to read them in context. The word Ger DOES NOT have only one interpretation as many of your side say. It has to be read in context as I have shown. 1) it is clear that the word Ger is used throughout the Tanach to designate various classes of foreigners within Israel. But its primary meaning is simply "one who does not enjoy citizenship through birth in the clan." (see Israel Ger in Egypt). 2) When Ger is followed by words describing location ("in your gates" "in the land," "in your midst," 'in Israel," "among you"), this does not necessarily designate a specific class of foreigner as different from the use of Ger in a single term. 3) The meaning of Ger must be determined by the wider context in which it is used. Its basic meaning of "non-citizen," "newcomer," "of foreign extraction" is always extant, but other factors, evident in some contexts, may indicate that the Ger has joined himself to Israel and is therefore a member of the covenant God made with Israel. But the word itself does not demand this. in the tanach, the word Ger simply denotes the social class of "foreigner." " In those passages of the Torah that emphasize the SOCIAL INEQUALITY of the resident alien, the septuagint usually translates Ger with "Paroikos," Greek for resident alien; in those passages of torah that emphasize the LEGAL EQUALITY of the resident alien, the Septuagint usually translates Ger with "PROSELUTOS, " a NEW GREEK WORD." (The begining of Jewishness pg. 121) (Emphasis mine). It is good to discuss Chumash with someone who has worthwhile observations to make. I take Ger (sojourner, alien) to mean someone staying in the land who is not a native. I think of Nochri (foreigner) as a non-native simply passing through (very temporary). But, if I were to grant your point, and say a Ger is any non-Israelite, whether a visitor passing through or someone residing in the land, it would not change the point. If Israelites can sell unclean meat to non-Jews, it seems it is no sin for non-Jews to eat unclean meat. If they do it in the land, they simply need to practice purification as specified in Lev 17:15 (when the Temple is standing). Judah, you wrote: "if a gentile wanted to keep the mitzvah to "remember God's commandments via tassels on the garment", the best he knows how is to buy the ones they sell to Jewish people." As you know, the life of the disciple of Yeshua involves numerous sacrifices and inconveniences. Non-Jews and Jews are equally created and gifted, so non-Jews can develop their own traditions quite uniquely and beautifully. I agree that the inauguration of the Commonwealth of Israel is enormously significant-- non-Jews may now be brought near to God in association with Israel. But access to God and association with Israel says and implies nothing about non-Jews being commanded, invited, or permitted to engage in distinctively Jewish practices. And certainly, non-Jewish disciples of Yeshua have not been given a blank check to ignore the wishes and well-being of the very community they have been associated with through Yeshua! Without a compelling biblical mandate to practice post-biblical Jewish practices, non-Jews should respect the uniqueness of those practices and the wishes of the community that developed them. If nothing else, it is a matter of simple respect and the acceptance of the uniqueness of others. You wrote, "If you object to gentiles doing distinctly Jewish things -- suggesting perhaps they should use fringes but not a tallit with knots -- such people are then accused of "silly, self-defined Torah observance", to quote one of your colleagues." As you know, the life of the disciple of Yeshua involves numerous sacrifices and inconveniences. For one person, it could be being called silly. For another, it could be having a colleague ho makes remarks like that. What a hoot: I meant "who," not "ho." Let's make it simple. Judah is right. Dan is right. Derek and Gene are once again in lala land (have you guys even READ Eph 2-3?). < wide grin > (praise and insults all plainly intended). Meanwhile, yes, I have read Ephesians 2-3. Would you care to discuss the meaning with me? Do you think I will be dumbfounded by your arguments? It is possible I have a well-developed interpretation. And, you jump to the conclusion that some of us are in fantasy land while others are "right" based on your as-yet-unexplained-but-apparently-authoritative reading of one part of the Bible. Meanwhile, I brought up quite a few other parts. You haven't addressed these texts which I have cited. you are wrong in your understanding of "nochri." The word usually describe someone alien and to be excluded. This word is regularly used of Israel's enemies, and of the nations that are characterized by foreign gods and idolatry (Josh. 24:20; Jer. 5:19; 8:19; Mal. 2:11). the foreigner designated by these terms is usually viewed as a dangerous and hostile (2 Sam. 22:45,46: Nehem. 9:2; 13:30). This words, also see "nechar" regularly represents foreign peoples (Ex. 2:22; 18:3; 21:8; Deut. 14:21, 17:15; Isaiah 2:6), or foreign wives (1 kings 11:1; Ezra 10:2). Only in Isaiah's prophecy of the millennial reign of Messiah is the Neichor brought into Israel's covenant, participating in the Shabbat as the sign of the covenant. (Isaiah 56:3,6; 60:10; 61:5). You have to allow a difference between a Gentile under the covenant and one who is not. You cannot have the cake and eat it too. A believing Gentile is grafted in and therefore enjoy in all the priviliges and bound by all the duties that a native-born is under, a non-believing Gentile is not. But I ain't no ho. You said: "A believing Gentile is grafted in and therefore enjoy in all the priviliges and bound by all the duties that a native-born is under." Is this a new style of argument you are inventing? LOL! Best Messianic debate thread evar. Even if I granted your definition of Nochri (foreigner), which I think is unsound, what are you saying? Would it be okay to sell cocaine to the heathen? If God allows the sale of unclean meat to the Nochri and the Ger, then if follows that they are not sinning to eat it. Okay, if you say so. Thanks for clearing that up for me. Oh yeah, we were debating this. So what's the point of you just asserting it? (1) Deuteronomy 14:21 allows non-Jews (the resident alien, Ger, and the foreigner, Nochri) to be given/sold unclean meat. (2) God would not permit an Israelite to sell or give something which would cause another to sin. (3) God does not regard it a sin for a non-Jew to eat unclean meat. Even if you interpret foreigner as "a hostile opponent of the Jews," my point still stands. And you're at pains to paint the foreigner and resident alien as nobodies in God's eyes. It serves you theology to do so. But let me ask you: why must the unclean meat be donated to the resident alien but can be sold to the foreigner? The answer, I'm not much for suspense, is that the alien is a protected class treated with charity like the widow and orphan, so it must be donated. It hardly sounds like the resident alien is a nobody in God's eyes who can eat Treif and snort cocaine at will as far as God is concerned. Something tells me you would not admit defeat if a voice from heaven said, "Derek is right." LOL. Not that I am officially one law, but the cocaine analogy seemed a bit over the top. Seriously, I think you don't understand what the debate is about. We're debating whether Christians need to keep kosher and Sabbath or not. But then you say, "that it would not be right to sell unclean meat to believing gentiles, in that they are to keep kosher." Well, I gave a host of reasons why believing gentiles, as you put it, are not bound to kashrut. You might add Genesis 9:3 to your list of texts about this, by the way. One other argument: if eating unclean meat is wrong, isn't it wrong for everyone? Can "unbelieving gentiles" murder and escape judgment? Derek, I have (I think) a hold of the argument, I just don't have the ability like most here to drop verses out of memory. I do spend a lot of time going over scripture that everyone references. That being said, I do recognize your valid points, but I also recognize Judah's also. Still sorting all this out, so perhaps I should think twice before taking a shot!!! Fair enough. It's impossible to tell abut someone's tone in online commenting. >> Something tells me you would not admit defeat if a voice from heaven said, "Derek is right." LOL. Why are you stretching so hard to avoid my side of the debate. i joined in the discussion with a biblical definition of GER. It is obvious to me that you cannot counter this so you are trying to engage me in donating and selling. So here is it a gain: Do you have any disagreements with my definition of GER? and, is the Ger in Deut. 14:21 the same as in Lev. 17:15? As usual, I want to offer my thoughts. I know people read them, though few rarely argue. I know the arguments and disagreements are there, but I think most people are either afraid to argue (or "just don't feel like it" in their words), or I'm blacklisted or something haha. But nonetheless, here are my thoughts that I'd like you to consider thoroughly. You're right, but not completely. I'll explain. Such gentiles have a real opportunity, and as time has shown quite clearly in recent times, HaShem moves them towards the direction of Judaism. Where you're wrong is that they are not immediately Israelites. That's why they should keep the Laws of Noahh (universal standard of righteousness) until the time they convert to Judaism. That is the process they are led on, after associating with a Jewish, Oral-Torah-believing Rabbi. That is the process HaShem leads them through. This all lines up quite simply with what I see in the Tanakh. There's a lot of Israelites who got swallowed up into the nations, and I think perhaps its time for them to come back. If not, its simply Jewish/Israelite souls going back to where they need to be, via HaShem's divine hand. Either way ("Two-House" or not), we have a big group of non-Jews who at least in part appear to be coming to Torah-Judaism, even though most of them still retain anti-Judaistic, anti-Oral Torah beliefs, among other Christian beliefs--the reason for them maintaining many such things, is because they're simply in a process of getting out, and into Torah-Judaism. The process looks a bit like this*. So I've learned to cut them some slack, the ones who are really really honestly seeking Torah at least. Unfortunately, there's only a few, like James, who have impressed me. Others just seem OK with their partial observance and are very stagnant in the process*. So, in conclusion, the only difference is that gentiles do not equal Israelites, bar none. No "gentiles in Messiah" equal Israel, that's not how it works at all. That is where we disagree a bit. HOWEVER, if they follow through they will be Israelites, and that's why there should be a difference in handling them (and why they should be encouraged to take up the commandments). That last sentence is where I agree with you and disagree with the "Messianic Jewish" perspective of the issue..
Derek wrote, "Glad to be one of the inconveniences of your path to discipleship with Yeshua :-)"
Derek--If you're happy, I'm happy. But now that the identity of the colleague has been revealed, I want to support and affirm you with all my heart by stating without equivocation that typos are not prophetic or revelatory in any way, at least most of the time. Although it may be sacrificial and inconvenient, not to mention annoying, for me and everyone else, I will stick by that statement. Context is vital. The use of Ephesians for your argument does not work. For Paul's context in Ephesians is NOT covenantal obligations, but the inclusion of the Nations into the body of faith. Additionally, this would even violate your use of the term “commonwealth.” Let's use the British Commonwealth for example. One can be a part of the British Commonwealth and still retain their unique citizenship in their home country (i.e Australia, England, Scotland, Ireland, etc.). One can be a part of the larger British Commonwealth whithout changing their specific nationality. This same logic applies similarly in the Commonwealth of Israel Paul seems to understand. Through faith in Yeshua, non-Jews are “brought near” to share in the blessings of Israel, but do not become “Israel” in the strictest sense (i.e. Jews). G-d has a specific role for non-Jews within the body of Messiah. If G-d intended for everyone to be the same, with the same covenental obligations, why didn’t G-d just do so. As a Jew, there is much of the Torah that does not apply to me. Either because I am not a Cohen or a Levite, because I do not currently live in Israel, because I am a particular gender, etc. So even for us who are Jews, Torah is a broad concept just as it is for non-Jews. And for both Jews and non-Jews there are specific aspects of Torah that apply and do not apply. SO the application of Torah in our lives today is something we all must wrestle with. (Not to mention we live nearly thirty centuries later!) Not only are we wrestling with how we apply Torah as individuals, we are wrestling with how to apply Torah principles to modern life. Quick example – the Torah does not address the internet. So, we must take Torah principles and ethics, and apply them in matters that were not originally intended. Anyway, my point is that this is complex. Torah is related differently to different kinds of people – including the way it gets applied to Jews verses the way it gets applied to non-Jews (with even further break-down within both groups). For just as Torah is applied differently to different types of Jews, Torah get applies differently to different types of Gentiles, as well. Anyway, you cannot make your claim through Ephesians. Otherwise you'll have to rewrite the context of the whole book. "Context is vital..." "no covenantal obligations..."
Eph. 2:12: "..Strangers to the covenants of promise....."
"One can be a part of a larger British commonwealth without changing their specific nationality..."
I think you got it....One can be a part of the covenant without becoming Jewish! "Context is vital. The use of Ephesians for your argument does not work. For Paul's context in Ephesians is NOT covenantal obligations, but the inclusion of the Nations into the body of faith." As far as obligations are concerned, I guess that would depend on which covenant you are referring to, Mosaic or Messianic. The obligations of the present covenant are perfectly clear from the emissaries writings, and to whom they pertain. They are applied equally to all believers in Messiah as they are requisite for entrance into His everlasting Kingdom. The fact that the present covenant is founded on the previous covenant explains in part why so many believers are now researching their relationship to that previous covenant. And all covenants made by YHVH continue to stand. When the seeking soul realizes that fact they will make every attempt to connect with everything that makes them complete in Messiah. Is that wrong? And ultimately these type of conversations will turn from the specifics of the practices to the goal of our trust in Messiah Yeshua. A goal for which Sha'ul was willing to toss aside his pedigree to achieve. As in most scripture the specifics are implied, not detailed. But when the dots are connected we see the picture of what YHVH has intended for us who trust in His Son. John 14:21, "He who has My commandments and keeps them is the one who loves Me; and he who loves Me will be loved by My Father, and I will love him and will disclose Myself to him." When I lived in the Commonwealth of Massachusetts, Jews, Irish, Italians, etc., all had to stop at the same stop signs, etc. There were community laws for all citizens, as diverse as the citizenry was. In sorting all of this out, I am very intrigued by the words of Carl Kinbar. Thought provoking. Maybe the key IS distinguishing between "Biblical Torah" and "Jewish Tradition" and allowing diversity of expression without ridicule as we try to keep the same laws. Aaron, I'll answer you this time. I usually don't because your posts are long and convoluted. LOL. Gentiles in Messiah are part of the commonwealth of Israel. I say this because I believe Paul was inspired by God when he wrote that. I don't believe the ultimate path for every Torah-seeking gentile is conversion to Judaism. In fact, there are clear statements from Messiah's followers that conversion is not required, but instead is discouraged -- James, Peter, and Paul actually agreed on this. I'm ambivalent about the Noachide laws. If they're super important and universal and applicable to the whole world, why on earth didn't God list it as part of the Scriptures? Why isn't there some clear statement from God himself: "Dear humanity, the Jews are to keep these 613. The rest of you, stick to these 7. Your Loving Father, God." The closest thing you have is Acts 15, where a minimum for table fellowship is listed for "gentiles who are turning to God". "When I lived in the Commonwealth of Massachusetts, Jews, Irish, Italians, etc., all had to stop at the same stop signs, etc. There were community laws for all citizens, as diverse as the citizenry was." Tandi, I don't think the "Commonwealth of Massachusetts" (a misnomer, because the state in no way differs from any other state in the union) is in any way comparable to say the British Commonwealth which is composed of many different countries, each in their own territory, each with their own laws (e.g. some may drive on the left and some, on the right - Canada (left) vs. Australia (right)), separate judicial systems, unique customs, etc. - but all swear allegiance to the Crown. "Maybe the key IS distinguishing between "Biblical Torah" and "Jewish Tradition" and allowing diversity of expression without ridicule as we try to keep the same laws." Tandi, I don't think you understand what Carl is saying. He's not advocating the One-Law agenda. Instead, I believe he's saying that if OL advocates claim to follow "Biblical Judaism" (and discount the modern Jewish faith as "rabbinics" as they often do) they should also have the courtesy of not muddying the Jewish identity waters through their copying of post-biblical Jewish customs, forms and nomenclature (which are 100% valid as a Jewish Torah expression for the Jewish people - meaning Yeshua would have followed them along with other Jews had he been born today). In other words, just as some Christians celebrate Passover in their own culturally relevant ways (painted eggs, bunnies, special church services, etc), One-Law folk are also free come up with their own ways of celebrating it (no need to copy "rabbinical" traditions that Yeshua may not have even known). I'm arguing just one thing here, just one simple position: gentiles in Messiah are part of the commonwealth of Israel, therefore they are not the same heathen gentiles spoken of in the Torah, including Deut. 14:21. "gentiles in Messiah are part of the commonwealth of Israel, therefore they are not the same heathen gentiles spoken of in the Torah, including Deut. 14:21." In reading the comments in this and a number of other blogs in the Messianic realm, including my own, over these past several weeks, I can only admire each individual's certainty that your interpretation of the Bible is correct in absolute terms. If I've learned anything from my active participation in this discussion over the past five weeks or so, is that I "know" much less now than I did before. God is the only absolute in the equation and as human beings, even if you confine yourself to a general "JudeoChristian" framework, the amount of variability and uncertainty in viewpoints is just staggering. Everyone uses the same document (the Bible) in different ways to produce different results. Is God really that flexible and can be adapted to so many different needs and desires equally, or is it really possible for one small element of one small subset of the Jewish/Christian world to actually hold all the answers with everyone else being in error? I can't even imagine a life where I always completely trusted my own understanding of the universe around me and never wondered if it were possible that I could have gotten something wrong. This isn't a pejorative against any of you. From what I can tell, most people do pick one viewpoint and then stick to it through thick and thin, no matter what. For me, it's as if I typed the search string "who am I in God" in my favorite search engine, clicked the "search" button, and have come up with infinite but contradictory results. I'm not smart enough to say "this one is right and that one is wrong" in my own so-called wisdom. "I'm arguing just one thing here, just one simple position: gentiles in Messiah are part of the commonwealth of Israel, therefore they are not the same heathen gentiles spoken of in the Torah, including Deut. 14:21." From where do you conclude that Deut. 14:21 is referring to "heathen gentiles?" That is where we disagree. As I do not see the role of Gerim among Israel as "heathen." In fact, many of these gerim were allowed to almost fully participate along with the Jewish people in the worship and practices of HaShem. So your logic can work, if you can support your point that Deut. 14:21 specifically refers to "Gentile heathen." Your point is mute. One can be a "member of the commonwealth" and still have seperate laws one is obligated to. An extreme example of this is the social stratification especially under British colonialism. Agreed this is an exaggeration of the point, but the essence remains. One can be a member of the larger commonwealth and subject to different set of laws. *(I am not saying Gentiles should be treated as second class citizens, or making any kind of affirmation of social stratification). Additionally, one can be a member of the broader commonwealth, but someone in England is not subject to exactly the same laws as a citizen of Ireland. Even if they are both part of the same commonwealth. Gene is correct, Massachusetts does not function under the same concept of an empirical commonwealth, rather it is a State within a larger union, not the union itself. Whereas the British Commonwealth, for example, is the larger union. Additionally - we all may have to stop at the same stop sign, but if I am not a legal resident of Massachusetts, but just passing through or on vacation, I don't have to pay specific taxes at the end of the year, register my vehicle, etc. However, I do not get certain residency benefits either. As such, using YOUR illustration, there are certain aspects of the Torah (moral and ethical aspects) we all have to "stop at." But there are other aspects of the Torah that are only the obligation of "legal residents." 1 Cor 10:31-33, "Whether therefore you eat, or drink, or whatever you do, do all to the glory of God. Give no occasions for stumbling, either to Yehudim, or to Yevanim, or to the assembly of God; even as I also please all men in all things, not seeking my own profit, but the profit of the many, that they may be saved." Perhaps you are overlooking something Gene? Sha'ul told his congregations to follow his example as much as he followed Messiah. Would Sha'ul instruct believers to eat unclean foods if he himself would not? Are you going to say that, "of course he would" since it only matters what Jews eat and who cares what a Gentile puts in their mouth? Did Sha'ul not follow his own teachings? Besides, the chapter is regarding food sacrificed to idols, not whether a ham dinner is appropriate for Gentiles and not for Jews. You're insistence that there are certain commands that I should not keep because I am not from the correct heritage, even though as a believer in Messiah I am commanded to bring esteem to YHVH and no offense to my brothers, is beginning to sound just like what it is, elitism. "You're insistence that there are certain commands that I should not keep because I am not from the correct heritage, even though as a believer in Messiah I am commanded to bring esteem to YHVH and no offense to my brothers, is beginning to sound just like what it is, elitism." Efrayim, the accusation that Messianic Jewish refusal to subscribe to the "One-Law" ideology is "elitism" is as old as "One-Law" movement itself (well, not that old may be 15 or so years). "All the community are holy... Why then do you raise yourselves above the L-rd's congregation?" Korah's accusation, just as yours, is baseless. He demanded priestly duties (as you demand Jewish mitzvot), even though he was not a Kohaine (and you are not a "Jew"), and he cited equality, "holiness", of all members of the community of G-d as the justification (as do you). Think about the above example and do not be like Korah - do not rebel against G-d's order under the guise of seeking to serve him better. All of G-d's community is holy, but we are not all the same. So, how do you interpret Eph. 3:6? The Jews are more fellow, and the Gentiles are less heirs? I understand your view. (And I won't feign pity this time, hehehe). I'll write another blog to discuss whether the fact that gentiles are first-class members of the commonwealth of Israel changes their relationship to Torah. "I'll write another blog to discuss whether the fact that gentiles are first-class members of the commonwealth of Israel changes their relationship to Torah." Judah, let me help you spare the median nerves in your carpal tunnels:) You will not "discuss" - we already know your conclusion to that idea! I have a far more interesting suggestion - how about you play a role of "devil's advocate" (where the "devils" are MJs who oppose One-Law), and write from that point of view (seeking evidence that Gentile relationship to MOSAIC TORAH (specifically) has not changed much or at all since coming to Yeshua. If you really search hard and still can't find this evidence, and instead all of your found clues keep pointing to your idea of equal obligation of Gentiles to Mosaic Laws as given to the Jews, then list supporting evidence from Tanakh and NT. I write a post from the Bilateral Ecclesiologist perspective, and you write comments from the One Law perspective. We could argue back and forth in the comments, like old times, only our views swapped. Wouldn't that be great? I think it would be hilarious. Guys, I'm signing off for shabbat shortly; I won't see your replies till later. All: have a good shabbat. "Wouldn't that be great? I think it would be hilarious." I think it would be great. Although if we do it tongue in cheek (to make our opponents' views look like those of fools), it would be funny - but not that helpful. How about we do a serious blog post - you advocate AGAINST ONE LAW specifically (not against Kinzer's BE and his book, etc. ), and I will advocate FOR ONE LAW:)? I think it would make messianic heads spin:) (I hope we won't be misquoted later out of context). Gene I am not asking you, or anyone else, to "subscribe" to anything except the truth. There is a disconnect between what has been the traditional interpretations of the writings of the emissary Sha'ul by the church system and what he really communicated to the believers of his time. We are reading his personal correspondence to his contemporaries, those of similar faith, who had been taught by him on his travels through the nations. To make the same mistakes now as the church system did in the past by taking one or two verses of what Sha'ul said and building a case on them will result in the same misunderstandings and confusion that has been going on all these centuries since the time of Messiah. 1. practice of or belief in rule by an elite. 2. consciousness of or pride in belonging to a select or favored group. if this is not what you are saying then you may want to clarify what you are implying rather than deny that you are indicating this very thing - namely, elitism. Righteousness is required for all believers in Messiah. Torah describes righteousness for the believer in Messiah. Therefore I will keep Torah to the best of my understanding and ability. Not "Jewish" traditions mind you, but the written Torah of YHVH. I assume that you are doing the same. Efrayim, you mean to say that "Ephraimites" do not pride themselves over "pagan Christians" and "rabbinic Jews"? Oh, the anachronisms going on here with regard to "commonwealth" as in "British Commonwealth"! I have heard this oddity a number of times from folks who just can't handing what Eph 2-3 is saying about Jew and Gentile being part of a SINGLE entity. πολιτείας [politeia] (Eph 2:12) simply means "citizenship." Its companion is found in Eph 2:19: συμπολῖται [sumpolites] meaning "same citizenship" or "fellow citizens." Common citizenship means a common government and common laws - in any nation in the world. Why should Messiah's Kingdom be different? Why do you confuse them with the facts? LOL! If there are some that do, shame on them. They should know better. I spent many years in the church system as that is all I knew at the time. I have tried to keep what is good and leave behind those things which do not belong in a walk with Messiah. Namely the mixing of worship of YHVH with traditions that are rooted in paganism. Whenever you have different people together in a faith environment you will have some type of mixture. Some good, some not so good. We are commanded to discern what is good, hold it close and do not let it go. There are many good things and good people still within the church system. I personally do not "look down" on either the church or the people in them. If by "rabbinic Jews" you mean unbelieving (not accepting Yeshua as the promised Messiah) rabbis, the answer is no, I do not "look down" on them either. On the contrary I long for their eyes to be opened by faith so that they might receive the promise of salvation and see them rejoice in the mercies of YHVH. If you meant "Messianic rabbinical Jews" that is somewhat different. While I don't "look down" on them I am disappointed that they seem to choose race over scripture and continue to cause divisions by their insistence on being held accountable only to themselves. I don't need an earthly rabbi. I have a heavenly one and He seems to know what He is doing about what takes place in this life. He has never steered me wrong on any question about any subject, and I have great confidence that He never will. Is that not what we have in the new covenant? Both of us? Gene...Judah... I am awaiting this new post with baited breath. This is appointment television. So.. "long and convoluted"... I thought you were a higher level than the typical impatient and misunderstanding blog reader that one must assume is reading... prove me wrong. Haha..
1. You believe gentiles are the commonwealth of Israel via belief. Which gentiles? All gentiles who believe in Jesus, or another group? 2. You don't believe entering into the faith of Israel is the end result for "gentiles in Messiah", because you think there is some alternate faith other than Judaism. That is a form a replacement theology, or at least a strong taste of it. Where does this alternate religion exist anywhere, even in the NT? It doesn't. 3. You also made a false claim that all these NT personalities you mention discouraged conversion. If you looked at them more in proper/Jewish context you would see that this is exactly what they were going for. Gentiles that had been associated with synagogues who were first required to start abstaining from a few basic things and not be burdened with an overload of Torah since they would be hearing it gradually in the synagogues week by week are not merely friendly tree squirrels eavesdropping on the backyard conversation--but gentiles on the road to being incorporated into Judaism (i.e. thus be made full members of the people of Israel). In fact, the saddest thing seen today are such gentiles which such a sudden desire for the Torah being led astray by "false shepherds" into alternate religions (i.e. Christianity or some Messianic brand), and being taught a very partial Torah observance, or non at all. But in either case, they're taught a whole lot of anti-Judaism/replacement theology. Blind leading the blind. Gene did a great job last Friday elaborating my comments on "Torah." I've posted similar comments elsewhere and in the past, but in those threads commenters continue to use the word "Torah" without any distinction between biblical Torah and post-biblical rabbinic traditions. Is there no distinction at all? If there is, what is it and is it important? The problem is, to unbelievers in the Oral Torah, something like the twice daily recitation of Qriyath Shema` is a "post-biblical Rabbinic tradition". This is completely not true, it is the the way Israelites have been keeping the command to speak of the matters of Torah upon arising and retiring for over a 3 thousand years. Same with the command of tefillin. If you don't believe me, simply see this irrefutable proof of a picture found on Tutankhamen's footstool depicting Israelites and Kushites from the 1st Temple period. You have skepticism of the 613 commandments of Torah being exclusively given to the unique ("holy") nation of Israel, as the Tanakh clearly states in multiple places and makes clear even in its specific commands for Israel not to be like any nation or any of the gentiles. The only reconciliation of your view is that the Torah is only for gentiles who become part of the people of Israel. The Torah states all Israelite males must celebrate the Pesahh; and that no uncircumcised males can celebrate the Pesahh. Furthermore, Israel may not follow after the ways of the nations; they must be unique. The entirety Torah is non-applicable to non-Jews because it is a system of observance designed for the unique nation of Israel specifically to be kept in the Land of Israel. The only grey zone is when gentiles are in a process of becoming Israelites. Then, they are in the process of learning and obeying the commands of Torah. That's what the process of the gentiles referred to in Acts 15 were in. We see clearly they were required to abstain from the remaining Noahhide Laws that they were not already adhering to prior to starting this process. Explain to me where you disagree, and where there is an alternate religion of Israel other than Judaism; and how you can support such a religion even from the NT; and how the idea of such a thing isn't a form of replacement theology. Those are all the questions I need to help me understand your view more. 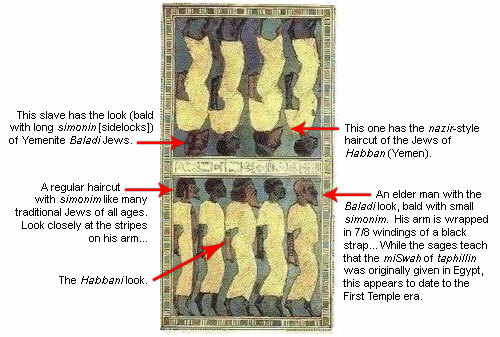 @Jewzilla, very cool graphic with First Century tefillin. "The Letter of Aristeas" is Second Century BCE proof that tefillin predates Yavneh by at least 200 years - by Hellenist Jews even. @Aharon, your reference to the Noachide Laws is off by about 200 years. They are not operable in Acts 15 because they were not formulated until the time of the Tosefta. There is no mention of the Noachides in the Mishnah or any other extant text prior to ~ 200 CE. My mistake, I was logged into a different account in the last thing I posted. Aharon and Jewzilla are both me. Perhaps the Mishna does not mention Noahhide Laws, but the Tosefta is not a far-off document. Its really just an addition to the Mishna, which is of course the core of the recorded Oral Torah. Perhaps I am wrong, and I'm open to that, but I don't immediately reject the concept of the Noahhide Laws as being authentic because they simply weren't written of before a certain point in time. Concepts of the Oral Torah found among the core texts existed long before they were written, as I'm sure you know. I clicked on your name and it took me to what seems a very interesting site, I'm going to check it out. Upon reading your post in greater detail, I find that your position raises more questions than it solves. In our time the Oral Torah is not accepted by the majority of Jews, so what kind of authority it has within Judaism? Do Reform, Conservative, or Reconstructionists adhere to the OT? Since as of today all three branches comprise the Majority within Judaism, who decides on what? Dan, I'm not arguing the authority of rabbinic Torah (that's a different discussion). I'm just asking for some basic clarity. When we discuss whether or not non-Jews should keep Torah, what "Torah" are we discussing? Aharon, you make a good point. Of course some rabbinic tradition tradition derives from the period before the closing of the Brit Hadashah. (See "The Traditions of the Rabbis from the Era of the New Testament" by Instone-Brewer, for example.) So I'll adjust my question. What I am asking for is some basic clarity about the meaning of the word "Torah." Is the argument about (1) "biblical Torah," (2)"Torah not attested in the Bible but discovered by archeology and scholarship" or (3)"post-biblical rabbinic Torah"? Seriously, is this too much to ask? @jewzilla/aharon. I tried to go to your site and my mcaffee and google will not let me view your site for malware. You may want to contact google. @Jewzilla, I agree that even though there is no textual evidence the oral tradition may still be ancient. In fact, I believe that to be true in more cases than not. Having said that, we have to remember that by the time of the Tosefta, Rabbinic Judaism had nearly 150 years of competion with Christianity, Ebionites, and Notzrim. When we examine the reactionary writings of the early "church fathers" we can see the contest at work from their perspective. Sadly, we sometimes are defined by our opposition to others. In reading ancient texts, we should seek to limit the damage in terms of bias that we encounter in what may merely be polemic. That there is no debate regarding Noachide Laws in the "New Testament" indicates that they were likely not operable in any form. Unlike ritual conversion, where the Apostles were fully engaged in the debate; and the words of Hillel and Shammai likewise indicate a more ancient tradition. >>When we discuss whether or not non-Jews should keep Torah, what "Torah" are we discussing? Defining terms for clarity is important, but each individual here probably has a nuanced answer to that question. And when Yeshua used the term that got translated "nomos", what exactly did He mean? By the way, Is the Sermon on the Mount for Jewish disciples only? Can I read and heed Yeshua’s words without trespassing on Jewish space? My understanding of Matt. 5, 6, and 7 is that I should obey the commandments of God, and that those who try to teach me otherwise will be called least in the Kingdom, and may even be wolves in sheep’s clothing. My understanding is that “narrow is the way and few there be that find it” -- strongly suggesting that the majority of the Church world is on the broad way that leads to destruction. Yet BE/DI urges us to go back there. Just heard about another potential convert to Anglo/Catholicism from the ranks of the formerly zealous torah observant Messianics with Evangelical Christian roots who have been given the unwelcome mat in Messianic Judaism. ". And when Yeshua used the term that got translated "nomos", what exactly did He mean?" " Or have you not read in the Law, that on the Shabbat the priests in the tenple break the Shabbat and are innocent?" Which Torah did Yeshua referred to here, since it is not found in the written Torah? I was wondering if any noticed that the word in the LXX for alien at Deut. 14:21, and the word in Eph. 2:19 are EXACTLY the same word. So, it's going to be line upon line, and precept upon precept. I offer this example to show you that you cannot RELY on Galatians for antinominism--- let's go to Gal. 2:21. "Galatians 2:21 For when justice is through the norm, then Messiah died for nothing!" norm : νομος. See BDAG 3rd edition, def. 1, and further copious documentation at above reference. comment1: The normal means of satisfying divine justice is for the sinner to pay the penalty of sin by his or her own death. This would be defined as the Torah's norm. But the Torah also provides for an extra-ordinary satisfaction of justice through the substitutionary death of Messiah. For the repentant sinner who commits himself or herself to God, Messiah pays the penalty for them, and the payment is imputed to their account, so that God forgives (pardons) the sinner. This is a penal payment only that is imputed. There is no need for the righteousness of Messiah to be imputed because that is not the basis of forgiveness. comment2: The traditional translations have totally destroyed the gospel in this text by turning it into an anti-Torah statement erasing the contextual sense of divine justice being satisfied by the Messiah. So, Derek I know you are relying on traditional versions,e.g. It should be painfully clear that this contradicts. Deut. 6:25. "Galatians 5:6 For in Messiah Yeshua neither circumcision anyone helps nor uncircumcision unless faithfulness through love working"
comment1: When is circumcision faithfulness working through love? When it is not combined with a false doctrine of acquittal and when observed in the land of Israel before partaking of the Passover or before receiving an inheritance in the land. Or in the dispersion to circumcise one's son's on the eighth day. Anytime that circumcision fulfills the commandment is faithfulness except when it is said to be for the purpose of an helping toward an acquittal. We don't have to look far to find people who think doing various things makes them good enough to justly deserve God's mercy. They are all around us. And it should not be forgotten that Paul's having Timothy circumcised was an example of faithfulness working through love. Gentiles in the dispersion have a dispensation to remain uncircumcised for the time being, even though they are joined with the house of Israel, a dispensation that will be ended when the kingdom comes. unless : αλλα = ει μη = אלא = unless, except. (cf. BLASS, §448). The sense is explained in the Greek by Thayer, "ουκ ...αλλα sometimes is logically equivalent to not so much ... as "; Liddell and Scott, "used adversatively to limit ...clauses". The word means "unless" or "except": Mt. 20:23, '...is not mine to give, unless for whom it is prepared of my Father"; Mt. 22:32, "Not he is the God of the dead unless of the living". The conjunction limits the first clause, i.e. "He is not the God of the dead" (which standing alone would be a false statement) to "He is not the God of the dead [only], except [also] of the living". John 3:13, "no man hath ascended up to heaven, unless he that came down from heaven". This usage is very important since the Semitic Apologetical Method, likes to introduce a statement with a seeming "untruth" only to qualify it in the next clause to make it true. It's a rhetorical teaching method that gets the attention of the audience. It is needed to understand a lot of biblical arguments like the classic "God is not the God of the dead, unless of the living" for proof of the resurrection. The point is that God is not the God of the persons who are just to be dead unless he plans to raise them. For why would they have him as God when only to be dead, or why would God be their God for them to be only dead. faithfulness : πιστεως. The Greek word πιστις in the very best Greek Lexicon means "1a. faithfulness, reliability, fidelity, commitment" (BDAG, 3rd Edition, pg. 818). It reflects the meaning of its Hebrew equivalent אמונה. Paul interprets Habakkuk 2:4 to refer to both Messiah's faithfulness and our faithfulness in response. Need I remind you Derek that Israel was uncircumcised in the wilderness, or that Abraham was unircumcised for some time after the covenant of the land was made? Need I remind you that we are dealing with a situation where people wanted to be circumcised to "become Jewish" to gain a special status with God, and that this is what Paul was arguing against, and not being circumcised just for the sake of the keeping the commandment through faithfulness working with love? I've cited a good many linguistic details in this post, Derek, which if you will admit their plain truth, your teaching the faithful in Messiah to rebell against Messiah's Torah falls to the ground. Bro, "conservative" Jews don't even reject Oral Torah necessarily, you need to see it the right way. Their movement is so that Jews can live only a partially Jewish life (partially observant) while being largely assimilated into the particular western country they are living in. Israel hasn't the same distinctions. The datim ("religious" for those who don't understand the term, I know you do) are roughly equivalent to "orthodox" Jews outside of the Land. "Masortim"/"traditionalists" are simply Israelis who are observant to some degree or another. Most Israelis are like this, and it isn't a solidified group with absolute bounds. I know several masortim in Israel who may not wear kippot except when they go to beit kneset on `erev Shabat; but they separate meat and milk in their kitchen, put up mezuzot, etc; or a variety and/or combination of various mitzvot. I'm not mentioning hhilonim/seculars or "reform" Jews for brevity's sake. @Tandi I don't have a specific answer about the Sermon on the Mount, though I'll likely address it in a future "What Did Jesus Change" blog. I do believe that a Gentile can read anything a Jewish believer can read and tried to express that thought in a previous blog post. How things apply may be the more relevant question, but since Yeshua told his disciples to make disciples of all (non-Jewish) nations (Matthew 28) teaching them (us) everything Yeshua taught them, I suspect there is an application "for the rest of us". @Tandi, I suspect that everything Yeshua taught applies to Gentiles based on his statement in Matthew 28 when he directed his Jewish disciples to make disciples of all (non-Jewish) nations and to teach them (us) everything Yeshua taught them. NOTE: I tried to make a comment a few minutes ago and it appeared to have disappeared into "cyberspace". If it eventually shows up, I apologize for the duplicate. Judah, im way late to the party, but disappointed by the simple fact that your not telling anyone that the TORAH is a part of the "New Covenant"! The same covenant ratified by the blood of the Messiah... This throws a wrench into shlomovich and lehmans theology! BIGTIME! "Judah, im way late to the party, but disappointed by the simple fact that your not telling anyone that the TORAH is a part of the "New Covenant"! The same covenant ratified by the blood of the Messiah... This throws a wrench into shlomovich and lehmans theology! BIGTIME!" Jesse, you are REALLY late to the "party." No one hear argues that Torah is not part of the 'New Covenant.' The only problem for the likes of you is that some things in that some Torah simply do not apply to you (just as some things in it do not apply to me). Accept it and learn to live with it. "Mitzvot Envy" is not a healthy way to move through life in general or relate to the Jewish people/Israel in particular. Cool.... that means that while you'll be enjoying a nice castle on a hill and a trillion heavenly sheckels (plus interest) in your First Kingdom Mutual Savings & Loan checking account, I'll be hanging out in the poor house with all of the Jewish apostles and elders who signed the Acts 15 rulling/letter to the Gentiles exempting them from many things in the Torah G-d meant only for the Jews. Couldn't think of a better company to be in. You are welcome to be the GREATEST, friend - I don't mind being the least (but we'll all be content with the lot G-d assigned us to). Gene you missed the whole point of Acts 15. It was to tell the non-Jewish faithful in exile that dispite their circumstances and physical circumcision they were still counted as citizens of remnant Israel. Of course, according to your reasoning non-Jews should not even be baptized, since the council did not lay that on them either. Since many other obligations were ommitted from the decree it is clear that the decree was not about obligations, but about minimum requirements. 3. No blood or trepha. Circumcision is the canary in the mine for all the things that people don't need to know to enter the kingdom. But once they are in the kingdom there are more sins to be delivered from than just the one's necessary to know your in the door.